Are you looking for display showcases made with quality material and reasonable pricing? 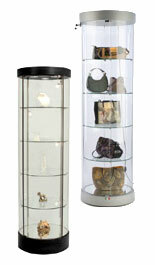 These tower display cases are great for retail objects, as a collectibles exhibit, and as a jewelry display. 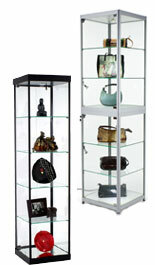 Choose from display cases with adjustable shelving, locking doors, and additional storage cabinets. Some of these showcase towers with locks feature either an entire oak frame or an oak wood finish with aluminum support framing. 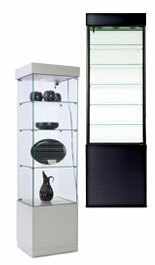 Many of these tower display cases come with either overhead lighting, side track lighting or both. In addition, many of these retail cabinets come complete with hinged tempered glass doors with a built-in lock and built in levelers. These display showcases are designed for users that have inadequate floor space. These glass towers are typically tall and narrow by design, yet can still hold a large amount of jewelry, trophies, or other collectible objects. Use these showcases in a business lobby to exhibit awards, or in a retail store to control access to high-ticket products. 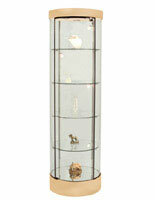 These glass jewelry cabinets are also commonly seen in museums and gift shops. Most of these display show cases are also suitable for residential settings. 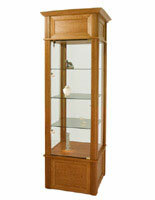 Buy one of these glass cabinets for your home to display family heirlooms or other fragile collectibles. There are display show cases offered here in many wood finishes as well as black and silver; something to complement most any décor. A new addition to these glass cabinets are the "frameless" towers. 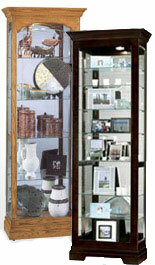 Each tower display case offers a full vision design with no framing to obstruct the view of the displayed merchandise. In addition to the many wood and glass designs, there are also several shapes to select from including; round, square, hexagonal and rectangular. The display case sold here is made with tempered glass. 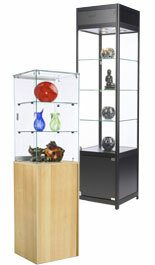 To find the showcase or tower cabinet that meets your needs click a category image above. We use tempered glass in lieu of standard plate glass, as it is much safer and more manageable should it happen to break. Browse through this selection of jewelry and retail cabinets with locks, we're confident that shoppers will be impressed with the selection and pricing offered here. The display offered here also features lighting elements to further highlight the displayed merchandise. There are also jewelry cabinets here that feature mirrored backs or bases. The selection includes trophy stands available with track lighting to spotlight specific merchandise such as crystal figurines or diamond jewelry. Many of the retail showcases offered here feature adjustable shelves, so that merchandise of varying heights can be exhibited. 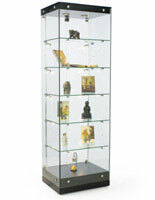 This display showcase can also be configured in several different ways, as many of the shelves are completely removable. Please see the product page for more specific information. 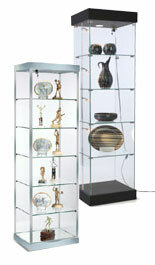 Choose a show case display from the above selection to place in your home or office. All of these retail jewelry cabinets feature locking doors for added security. With few exceptions; all of the show case display units ship completely assembled. Buy a show case display here today before 3PM and choose one of the many quick ship options. The majority of these glass cabinets ship within 3-7 business days, not weeks like most of the competition. When buying a showcase display what are some key factors to consider? The area where the tower showcases will be placed should be measured prior to purchase to ensure a proper fit. Shoppers should make sure that the show case display chosen can fit through all applicable door ways within the building. Customers should have satisfactory staff/persons available to move the unit upon delivery. What shipping methods are offered with these tower showcases? This show case display selection all ship via freight with different options offered. These tower showcases with locks can be delivered to a dock, the front door of a residence, or brought inside, set up, and all debris removed. For further information regarding shipping options contact a call center staff member. This show case display line-up is just one of the many specialties offered here. Our large facility located in Fall River, MA contains thousands of in stock displays. Producing POS displays in the United States since 1974; this company has a time-proven reputation as one of the leading suppliers in this niche business. This site offers the following specialty services: stock samples, custom prototype samples, pre-quoted shipping, silkscreen imprinting, nationwide drop-shipping, prompt proof of delivery, special protected packaging, inserted graphic materials and promotional roll-outs by date. Also if you have your own design ideas, we'll take your custom display and turn them into reality. We welcome your custom point of purchase display design ideas! Our small-run/prototype department will readily produce an actual size sample display of your custom design to your specifications for your approval. As a direct manufacturer we manufacture and ship most custom orders within 2-1/2 weeks. For your display needs choose Displays2go, your #1 acrylic manufacturer. Another name that you may know us by is Plasticrafters, which now represents our sale and discounted merchandise. Many e-commerce companies with online catalogs exist only in cyber space. We are a real display manufacturer with real people. So even though this website is here 24 hours a day, there is also a fully staffed call center here during regular business hours. Feel free to call a customer service representative between 8:00 am and 5:30 pm EST, Monday thru Friday at 1-800-572-2194, Fax: 401-247-0392.